Cruise Family spotted leaving their Copacabana Palace Hotel in Rio on Saturday, 31th. The family will be hitting up several tourist sites in and near Rio before Tom’s a press conference on Tuesday. Tom is in town to promote his latest WWII flick, Valkyrie, which also premieres in Brazil on Tuesday. After leaving the posh Hotel Copacabana Palace, the family was seen traveling with a four-car convoy amid heavy security. They entered a Brazilian military base and hit a beach within the residential area of the compound. 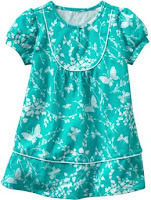 Butterfly Printed T-shirt Dress by babyGAP. Suri & her parents spotted entering Copacabana Palace Hotel in Rio on Friday, 30th. Suri & Katie went to a puppet show at the Bob Baker Marionette Theater in downtown Los Angeles on Friday, 23. Pink Smocked Dress by Sarah Louise. Last night they were busy at the Berlin premiere of “Valkyrie.” And this evening Tom Cruise and Katie Holmes are posing at the premiere of husband Tom Cruise’s WWII flick Valkyrie held at London’s Odeon Leicester Square on Tuesday, 21. Katie recently signed to be in the independent comedy, The Extra Man. “This is a film for our times, these hilarious characters living on the edge of enormous wealth, scrapping for small pieces of the pie,” producer Anthony Bregman told Variety. Katie Holmes, wearing a curious black patent hat, arrived in Berlin last night where she's joining her hubby, in town to promote “Valkyrie”. But they're not the only famous actor couple in town - according to OK, the Cruises may be spending some time with that OTHER couple while they're in Germany - Brangelina! After all, they do have quite a bit in common...adopted kids, movies set in Germany, a biological toddler...Maybe Suri and Shiloh will become best friends! later TomKat attended the Berlin premiere of “Valkyrie” on Tuesday, 20. 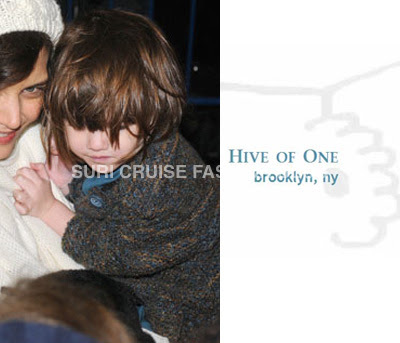 Suri is wearing the Navy/Teal/Tan Sweater Coat and Teal Dress - the outfit was designed and created by Hive of One - an independent Brooklyn, NY, childrenswear designer. This outfit was made specifically for Suri and presented as a gift to Katie from a fellow actress in All My Sons, Danielle Ferland. 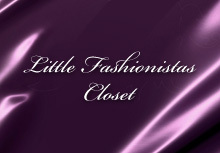 This info was exclusively provided to SCFB by the Creative Designer of Hive of One - Shanna Yarbrough. On Sunday (January 11th) Katie will wrap up her brodway performance of All My Sons by Arthur Miller. During the 4-month-run her reviews were pretty good, but one recent night really stood out - it was Katies 30th Birthday and Tom didnt let this go unnoticed. Though Tom couldnt be at the party himself, little Suri joined her mother on stage for the celebration. Katie's co-star John Lithgow and the rest of the cast - saying "Happy Birthday!" 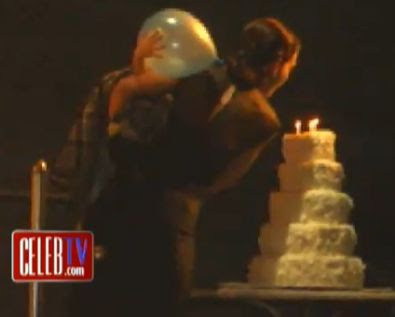 and than Katie blew out the candles of the giant 5-tier cake that was sent by Tom. Suri & Katie were spotted leaving their New York City apartment for the final performance of the Broadway play “All My Sons” on Sunday (January 11). Suri & Katie were escorted from their posh NYC pad to the Gerald Schoenfeld Theater, where they arrived to an already large crowd of gathered fans. 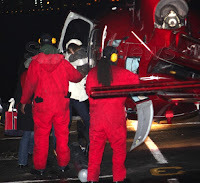 and after the last performance of All My Sons, Suri & Katie headed to the heliport at 30th Street in New York City. They are flying out to Los Angeles in time for Katie to catch the Golden Globes After Party. Suri & Katie spotted leaving the theater in the middle of a somewhat rare New York blizzard on Saturday, 10. Suri is wearing one of her favorite white coats - Scallop Placket Coat by Best & Co, which she first wore on December 9th. Suri & Katie were spotted making their way to the Gerald Schoenfeld Theaterfor the final Friday night performance of Broadway show “All My Sons” on Friday, 09. Meanwhile, Katie will be finishing up her Broadway run with a final performance scheduled for Sunday night (January 11). 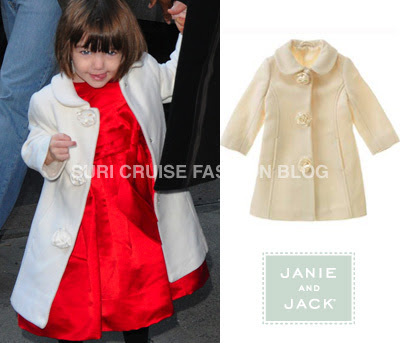 Suri is wearing White Tillie Corduroy Dress by Ralph Lauren Children. ... and White Coat from Tartan Rose line by Janie and Jack, which she first wore on November 28th. 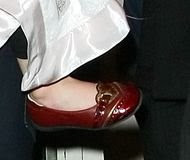 Suri & Katie were spotted leaving their NYC apartment, for another night at the theater on Friday, 09. And it looks like little Suri was all about mothering her Cabbage Patch Doll, as she pushed its stroller past the shutterbugs. Following the evening’s performance of “All My Sons,” Katie was spotted outside the Gerald Schoenfeld Theatre signing autographs and greeting fans. Suri hung out while her mom tended to her professional duties, all the while clutching a play bowling set that no doubt kept her occupied during the show. Suri & Katie shop at the Japanese casualwear store, UNIQLO, in SoHo, New York City on Thursday, 8. Earlier in the day, the mother-daughter duo went down the block to Dean & Deluca to pick up a cookie. 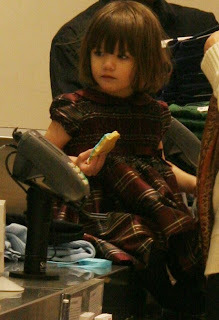 You can see Suri chomping on the cookie as she browsed the racks! 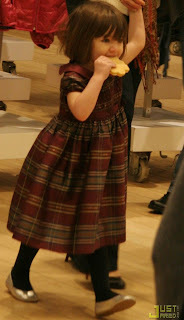 Suri is wearing Hand-Smocked Plaid Silk Dress form Luxe Celebration line by Janie & Jack, which she first wore on December 9. 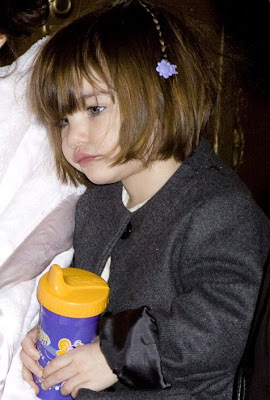 In the afternoon, Suri & Katie were spotted leaving a music school in New York City. Suri & Tom joined Katie after the show, as she greeted fans outside the theater and signed autographs. And as the happy TomKat family arrived home at their SoHo apartment they all looked like they were ready to call it a night. 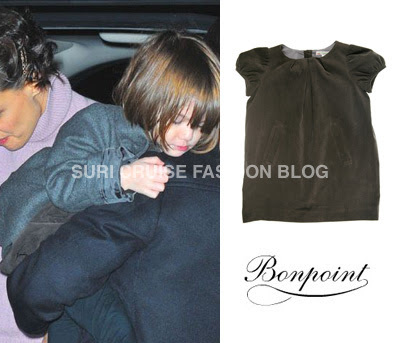 Suri is wearing BELLES Ribbed Velvet Dress by Bonpoint. Bonpoint A/W 08/09 Collection is on SALE now at LFG. Katie Holmes has spent a staggering $14 million in New York since moving to the city six months ago, it has been claimed. The actress arrived in the Big Apple in July to appear on Broadway in the Arthur Miller play, All My Sons. And since then she has been living in a Manhattan apartment owned by husband Tom Cruise and has been a regular fixture on the city's social circuit. Now the New York Post's Page Six magazine estimates that - largely thanks to reported real estate purchases - she has spent more than $14 million since being there. According to the publication, she and Cruise have bought up three more apartment units in the building where he has owned his home since 1985. A spokesperson for Cruise has previously denied the purchases but real estate executive Barbara Corcoran claims they bought a trio of lofts last year. The magazine says a similar, three-bedroom home on the same street is on the market for $4.8 million, and calculates that the Cruises would have spent $14.4 million on their apartments as a result. Meanwhile the couple is reported to have spent an additional $7,000 on installing gymnastics equipment in their home for two-year-old Suri - a total of $14,407,000 on real estate. - and $5,415 on cultural activities, including a trip to Broadway show The Little Mermaid and to see Tina Turner perform at Madison Square Garden. The final performance of All My Sons will take place on January 11 when Holmes is expected to return to the couple's lavish home in Los Angeles. Suri & Katie made their way to the Gerald Schoenfeld Theater for another performance. Katie is in her last week of work following four long months of performances. Quite impressive by all means, Miss Holmes hasn’t missed a single performance during the long stretch of shows. 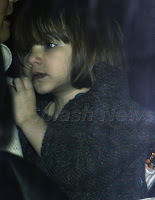 Suri & Katie leave the theater after a performance in NYC on Sunday, 4. Suri showed off her purple flower clip and fancy braids. Suri & Katie headed out for a matinee showing of “All My Sons” on Saturday, 3. 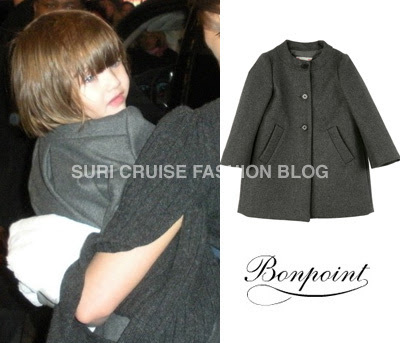 Suri is wearing BALENCIA Boiled Wool Cloth Coat by Bonpoint, which she first wore on December 13th. Suri held onto a big white balloon while Katie signed autographs outside the the Gerald Schoenfeld Theater in New York City on Friday, 2. 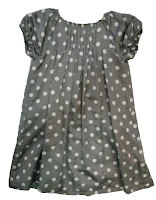 Grey Dot Dress by Floriane. 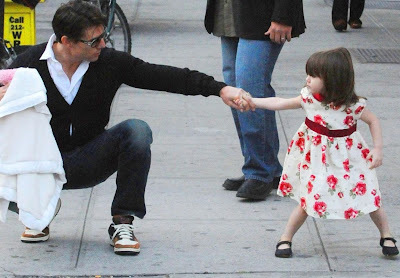 Suri & Tom escorted Katie from their New York City apartment to Broadway on Tuesday, 30. The trio were on the way to the Gerald Schoenfeld Theater, where Katie was booked up for a 7PM performance of “All My Sons”.